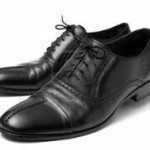 Creating online store is not as difficult as you think. Shopify, Bigcommerce and Volition are 3 of the top stress-free e-commerce platform providers. I’ve read a few reviews and they all seem fairly easy to start, good value for money and have a good customer support. They all offer 14-15 days free trial. I’ve decided to give then all a try and see how far I can go and how I feel. OK, let’s start with Shopify. Firstly go to www.shopify.com and register with your email address. Enter your basic information – your address and phone number. It takes you to WordPress-like admin page. “You have 13 days left of your trial” – I thought it was 14 days. I registered at 5pm, and it’s 9:30pm now. Global time difference? Never mind. Scroll down and there’s a “Select a Theme” button. There are 18 x free themes plus 100+ paid themes, costing $140 – $180. I chose the once called “Simple”, but it looked a bit too simple with some products displayed straight on the Home page. Nothing’s wrong with that, but I personally wanted something with a flash banner, so I’ve chosen something else. I’ve chose the one called “Brooklyn”, shown below. Click “View Demo” then it will open a new tab to show the face of the page. I was happy, so clicked “Publish Theme” It will download the theme onto your platform within seconds. Go back to the main menu – click any of the icons on the main menu at far-left. 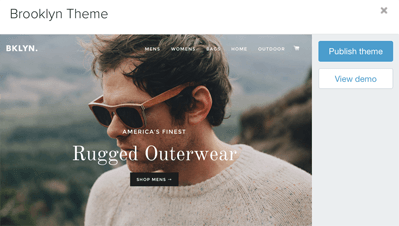 And realised the photo of the man with sunglasses in “Brooklyn” theme was just a template example, so doesn’t come with it. I’ll have to find an image from somewhere else. 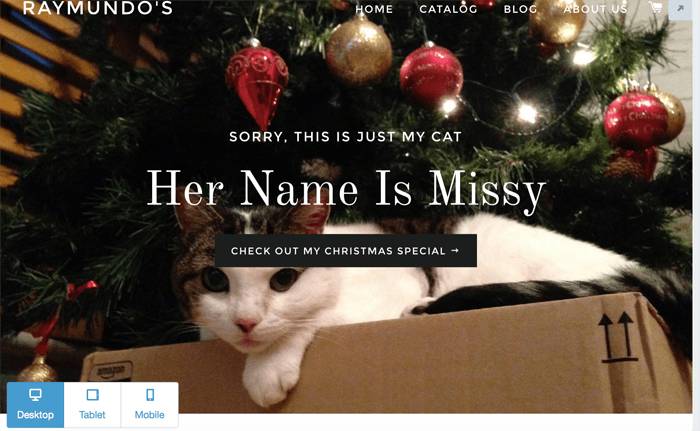 Click “Home page – hero slideshow”. It tells you that you can save up to 5 images to slide. You can link each image to a specific page by entering the url. Unfortunately I don’t have a relevant image handy, so this will do for now. You can choose the text either in black or white, and there are 40 different fonts to choose from. As you can see on the bottom-left corner, you can check how the page will look like in desktop, tablet & mobile. In this “Customise Theme” section, you can also save your logo, another header image and favicon. I’ve saved all I’ve done so far. Now go back to the main menu on the left, go to “Product” to add products. Sub-menu “Product”, then “Add Product”. So I’ve added a shirt. Title, description and image of the shirt I’ve uploaded. You can’t possibly do this one by one manually when you’ve already got 100’s of products to sell. So now I’llsee if I can import information from a database. I don’t have a database so I’ll make one. You can use CSV, Excel or Numbers if you are a Mac user. If you know how to use a spreadsheet it’s quite straight-forward, otherwise it may be tricky. 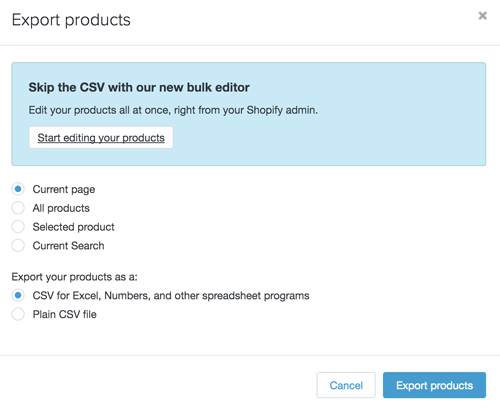 What you have to do is to follow the first line, add rows by filling in each product information, then “import”. I just quickly typed in a couple of fake products. 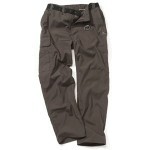 I’ve uploaded a sample photo of trousers & shoes to my website. If you scroll the CSV file to the right, there is a box to put the link url to the image. I’m using Mac so I’m using Numbers which looks like this below. The first line was there as a Shopify example. I’ve added items on 2nd & 3rd lines respectively. I save the file on my desktop, click “Import”, select the saved file, and click “Upload” button. A box with message comes up that says “You will be importing approximately 3 Products with a total of 3 SKUs (Stock Keeping Unit…your distinctive stock code) and 3 Images. Importing will not overwrite any existing products. There is an option to tick, if you’d like to overwrite. 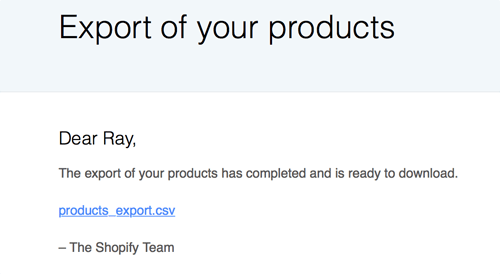 Shopify successfully completed your batch import. 0 products failed to import. So I get the idea, and I hope you do too, the image above shows that the blue shirt at the top is the one I manually added. 3rd one “Example T-Shirt” is the example already in the template. 2nd & 4th items are the ones I just added to the spreadsheet and imported. remember if I’ve added its price. So what I can do is to export everything to a new spreadsheet, edit and make sure all the information is in the spreadsheet, then import them all back again. Now click “Export” button, and this window comes up as the image on the right. I check “All products”, Leave the check in with “CSV for Excel, Numbers, and other spreadsheet programs”. A message comes up and says “Your Export will be delivered to your email xxxx@xyz.com”, my registered email address. Email with a link is received instantly. So far, it’s very impressive. 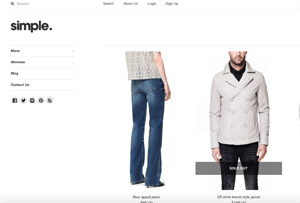 What I like about Shopify is the interface & layout of each page. It’s never “busy” with too much information. Big buttons. I may have just said “Click the import button” and you may wonder, where will the button in the page be? You’ll never miss these things. If you have used WordPress and familiar with it, then you’ll be swimming. I’ll move on to check the price plan & payment information, but so far I think I’ll give Shopify a perfect 10/10. 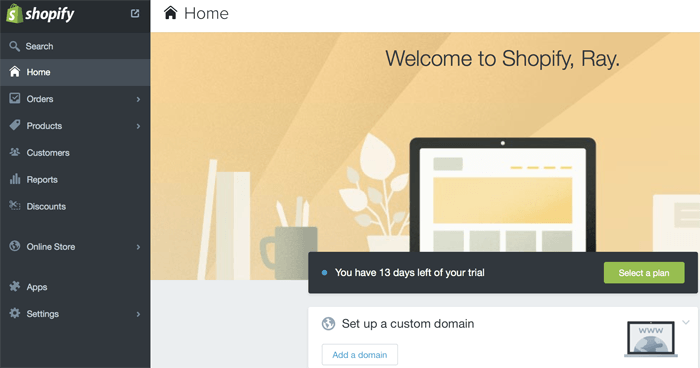 Shopify Ecommerce – Start your FREE trial and see if you like it.